It's here - the fully loaded DVJ-1000. Offering the same operation and layout as the CDJ-1000MK3, but with enhanced DVD specifications, the new deck allows DJs to easily create and add visuals to their sets. Its core CDJ-1000MK3 capabilities are enhanced by several groundbreaking features, while DVD visuals can be manipulated as you would music; so digital video scratches, loops and instant cues are all possible. DJs can perform audio-only sets while having the option to mix DVD with a powerful and versatile range of effects on hand. The best of both worlds. The DVJ-1000 can be slotted into existing booth set-ups making it a logical purchase, fusing a high-quality CD deck with the future - where visual artistry is becoming commonplace. Additional features include MP3 compatibility (with an intuitive navigator), a brighter and larger WAVE display, studio-quality 96 kHz/24-bit audio and several new innovations like 4X hyper jog mode and a back-and-forth loop button. It's a globetrotter too, playing both NTSC and PAL DVDs using a built-in standards converter; ideal for performers working with DVDs from Europe and the States. Talking of visual artistry, research shows that around 70% of clubs and 60% of music bars are installing visual equipment; so there's a definitive need in the market for future-proof technology for creating imaginative and engaging visual sets. The DVJ-1000 offers the standard features and enhanced specification of the CDJ-1000MK3, allowing DJs to easily add visuals to their sets. It includes 'JOG feeling adjustment' that tailors the deck to performers' individual styles and retains the familiar look and feel of the CDJ-1000MK3 with pitch control, cues and loops executed in the same intuitive fashion. The deck supports CD (CD-R/RW) and DVD (DVD-R/RW) media and performers who work with DVD in Europe and the States will value the convenience of built-in PAL/NTSC compatibility. The DVJ-1000 sets a new benchmark for music portability - up to 1,000 MP3 tracks can be accessed on DVD-ROM - and provides the most advanced deck for working with this ever-popular format. When connected to a preview monitor, the MP3 Navigator makes track selection a breeze: the information is displayed on a larger screen, DJs can search for music by file and up to eight subfolders (for example, genre of music, artist, track) and seven lines of text are available. For ease, a cursor button is included on the deck to scroll through and select files. DJs also receive more information from the Preview Output Display. This enhanced feature provides an extensive dashboard (through a preview monitor) that displays key information for DVD, CD and MP3 including: DVD content, WAVE, title, artist, album, main cue points and three hot cue points. 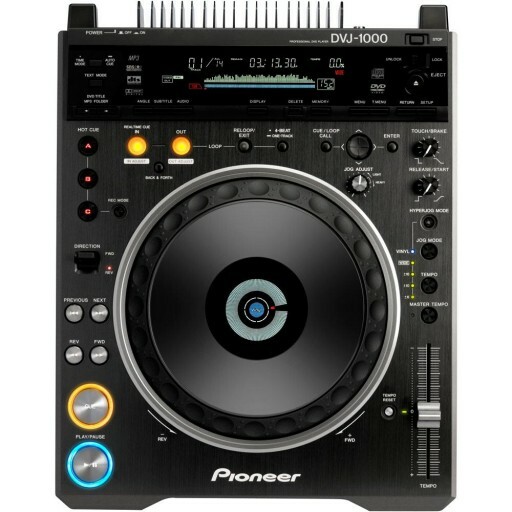 The DVJ-1000 retains the recent display improvements to the CDJ-1000MK3. The 360° On-Jog Display is improved by being raised on the wheel and lit fluorescently, the cue marker is larger and the 45° angle marks make it easier for scratch DJs to time their effects. The track display's resolution has been doubled and the lighting is multicolor and fluorescent, while the WAVE data and playing address data encompass a complete track. With its 96 kHz/24-bit audio, the DVJ-1000 will be used by studios, producers and artists who have the option of outputting their tracks in optimum clarity. Connected to our digital chain of mixers and effectors, the DVJ-1000 delivers unparalleled audio quality. Another feature that appeals to music professionals is our Legato Link Pro. This digital filter applies up-sampling technology to reproduce audio information lost in some disc formats (DVD: 48 kHz \ 192 kHz; CD: 44.1 kHz \ 176.4 kHz). an adjustable loop in point and the back lighting of the re-loop button. For DVJs who use short video clips, the one-track loop button is a convenient feature - it repeatedly plays back the content. A new 4X speed hyper jog mode has been created to support rapid searching. This also accelerates the speed at which video and audio can be scratched to extend creativity. The search facilities are complemented by a new manual search facility using the Jog Wheel (at up to 160X speed) and the WAVE display to locate tracks. As with the CDJ-1000MK3, gold RCA connectors are included and the deck also has a digital out to ensure the highest level of sonic purity when connected to the DJM-1000 or DJM-800 digital mixer series, for example. In addition, the deck includes a 'resume play' function to restart playing from the same point if a CD or DVD is accidentally ejected. MP3 Playback from DVD-R/RW, CD-R/RW: Allows playback of MP3 files recorded onto DVD discs (record about 1,500 MP3 songs depending on bit rate and compression technology used). 4-Beat Loop: Pressing the button while playing automatically sets a seamless four-beat loop. 24bit/96kHz Digital Out: The audio output for DVD provides a connection to a Pioneer digital mixer (DJM-1000, DJM-800) that retains the signal path entirely in the digital domain for a cleaner sounding mix with less noise and distortion. Preview Monitor: A preview screen shows a range of information without the need to switch display modes, including: track number, time, track name/artist name/album title, wave display, playing address, hot cue point data and cue point data. Cue / Loop Point Navigator: Display memorized cue / loop point information on the preview screen of a monitor (12 points per page) for quicker navigation and callback of stored data.